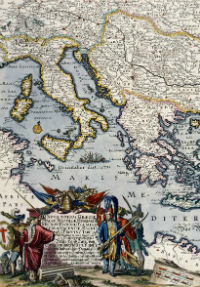 Examples from amongst the University’s 15,000 rare and historical maps have joined the Teaching with unique collections website. Maps offer many learning opportunities as they communicate information across diverse subjects ranging from spatial imaging to ancient history, and they show our ever changing perceptions of the globe. Also new to the website is a page featuring helpful videos. Academics, collection managers and students explain their object-based learning experiences, including creative writing students visiting the Map Collection.